While I'm away in China, I'll be taking an unintentional hiatus from blogging, social media and work thanks to China's censorship laws. During my time away you'll be hearing from some of my good friends in the writing world. Welcoming Katie. Hey readers! Katie here again. 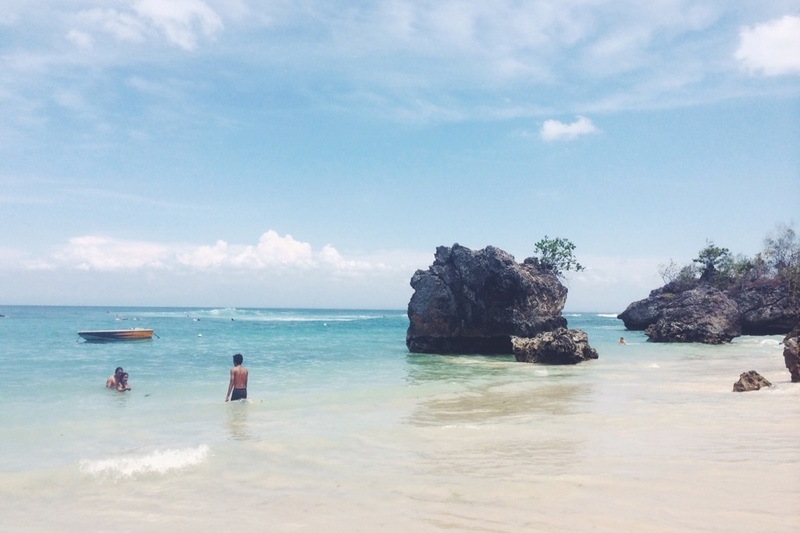 One of my favourite days spent in Bali was spent at Padang Padang beach in South Bali. It's a bit of a drive from the main tourist districts of Kuta and Seminyak so it's worth making a day out of it. Book yourself a driver for the day as it can be hard to pick up a cab returning from the beach. Seeing as it's a decent drive, expect to pay around $40AUD for the day. Get to the beach earlish – go all the way to the left once you're on the beach where the sand goes more inland into a big cave area. If you're sitting on the front of the beach you might lose your spot when the tide comes in later in the day! There are little stalls on the beach selling water, beers and snacks so there's no need to take anything food-wise. This beach is absolutely stunning – imagine walking down stairs carved out through a mountain and then walking out onto white sands leading into aqua green water. This.is.paradise. If you're staying in Kuta or Seminyak, it's worth seeing some other things around the Jimbarran/Uluwatu area while you're there. Once you've had enough at the beach, you could get your driver to drop you at Rock Bar on the way home. Rock Bar is one of Bali's trendiest places to have a drink and is part of a Luxury Spa hotel. The bar doesn't open until 4pm but get there around 3:30pm as otherwise you'll be lining up. In my opinion, it's a cool bar to try once if you get there early and don't have to wait, but unless you're a guest of the hotel you don't get the good seats. Plus, expect to pay around $20 for a cocktail! You will easily be able to get a cab after your time at Rock Bar so you could keep this in mind when booking your driver for the day. Another option is to stop in Jimbarran Bay for dinner. If you're doing this you might want to get to the beach a little later so you're not too exhausted!. Jimbarran Bay is Bali's coolest (and I mean cool, not trendy) place to eat seafood. I remember going here with my mum and dad as a little kid and it hasn't changed one bit. You'll be sitting right on the beach with no light except the candles on the tables. Often there are thunderstorms over the water but no rain - seriously amazing! Menega is supposed to be great but unable to get a table outside last time, I went to the one next door to the left. No complaints!! If you're looking for somewhere cool for a drink afterwards, walk down the beach to the left and you will stumble upon a tiny restaurant/bar where you can sit on the beach with a beer. Have you been to Bali? Got any tips for us? We'd love to hear them.